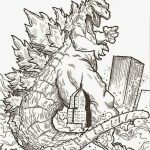 Of all the gigantic popular monsters invented in this popular culture of ours, Godzilla is probably the most famous one. 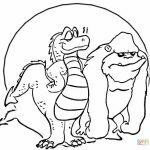 I mean, you know, we've seen all sorts of abnormally monstrous animals in movies like Anaconda, giant spider, Kraken-inspired octopus, but nothing is really stuck in our mind like Godzilla. Do you agree with me? Perhaps, it's the name that helps this Japanese monster continue to exist today. 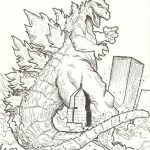 Ever since Godzilla was revealed on the big screen, people now like to use suffix -zilla to describe anything gigantic, both in physical appearance or capability. 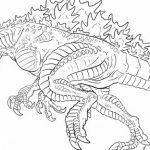 Either way, if you're a fan of this monster, then I'm sure you can enjoy these Godzilla coloring pages. 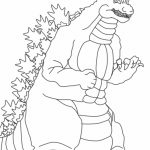 The vicious monster Godzilla comes in various depiction in these printables. 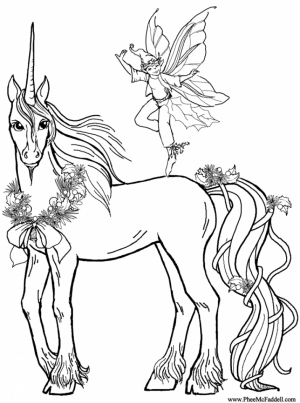 Some look very cartoon-ish which is perfect for young children since they're much simpler than the rest. 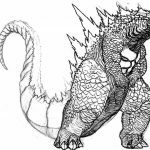 Some others have far more details, emphasizing the frightening monstrous look of Godzilla. There are even a couple of them that looks like a robot. 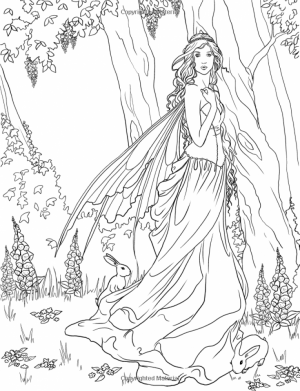 All of these coloring pages are free so long as you keep them for personal use. 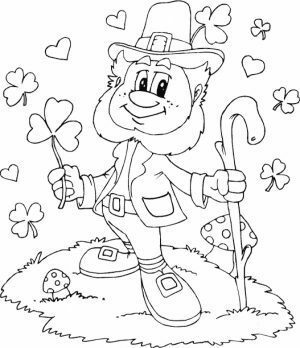 Do not ever attempt to use them commercially since you may violate the copyrights of the respective owner. 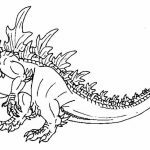 Now that you know the rule, pick your favorite Godzilla printable, print it, and color it like you really mean it. 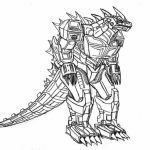 I'm not sure if the creator really means it but Godzilla has a healing factor that rivals that of Wolverine. Seriously, this monster can't die like forever. In ‘Godzilla vs. Destoroyah’ (1995) his nuclear heart has a literal meltdown. In the brutally titled ‘Godzilla, Mothra and Ghidorah: Giant Monsters All-Out Attack’ (2001) a missile planted inside the monster’s chest explodes, causing yet another complete disintegration, but the franchise trap door is kept open by a final shot of the already dismembered Godzilla’s heart beginning to beat. 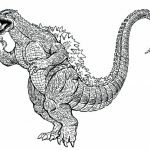 A blend of the English word gorilla and the Japanese word kujira (which means whale), the name caught the ear of character co-creator Eiji Tsuburaya, who borrowed it for the title of his 1954 black-and-white creature feature. 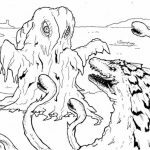 The film was a massive hit, and executives at Japan’s Toho Studios hoped to give it an American release, but worried about the title’s marketability abroad. 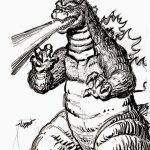 Thus, "Gojira” became “Godzilla” in the U.S.
Long before Disney and Marvel made cinematic universes cool, Toho was creating its own giant monster universe throughout the 50s and 60s. 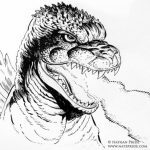 Films like Mothra, Rodan, The Mysterians, and Varan the Unbelievable all introduced original characters that would eventually interact with each other in later films, setting the groundwork for maintaining a singular cinematic universe with Godzilla at the center. In many ways, Toho and Godzilla were unintentionally way ahead of their time. It could even be argued that they built a legacy for how Hollywood filmmaking operates today, whether they realize or not. 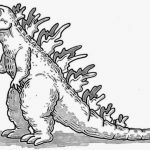 In the old days, the roar of the Godzilla was created by rubbing a leather glove over a string of a bass violin. That's why it has always changed through the years. 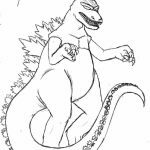 Speaking of changes, Godzilla was firstly depicted as a giant mutated octopus. 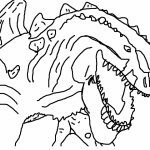 However, the producer, Tomoyuki Tanaka, felt more content with a dinosour-like figure. 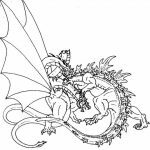 Related Posts "Godzilla Coloring Pages"